Who knew that banging on your car hood might save a life? When the weather turns cold, outdoor cats seek warm, quiet, secluded places to rest. What better place, then under the hood of a recently driven car that’s nice and toasty warm. The injuries that can occur include burns, lacerations, degloving injuries, fractures, amputations, severe head trauma and internal injuries. So give a kitty a break and thump on the hood or toot the horn before starting your car in cold weather, especially if the engine is still warm from a previous drive. 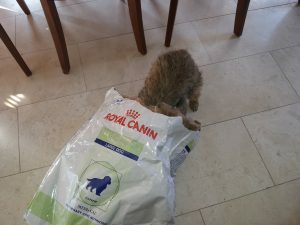 Celine is Dr. Rosely’s cat that was originally name Audi, as she was found in the fender of an Audi A4. A client brought her to the clinic for evaluation after the car was dismantled at a local high school autobody shop to rescue her. 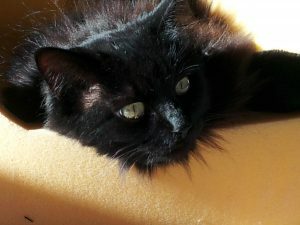 Thanks to the good warmheartedness of Teresa, Celine has a warm, safe and loving home. Dogs and cats can become skittish and anxiety ridden on Halloween due to the repeated ringing of the doorbell, constant squeals and chatters just outside the door. 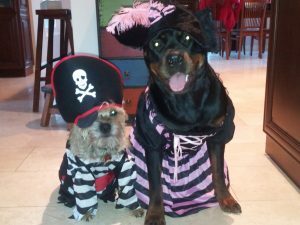 Candy and chocolate are never good for dogs or cats and on Halloween there is an increased chance that Fido and Fluffy may consume treats meant for tricksters. 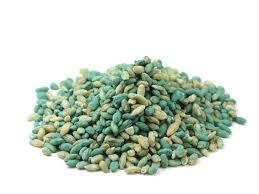 • Chocolate and xylitol, a sweetener found in many candies, can be extremely toxic to pets. • Lollipops and their sticks can be choking hazards and cause a painful obstruction or foreign body ingestion that may require surgery to remove. The toxic principle is very concentrated in the bulbs (versus the leaf or flower), and when ingested in large amounts, can result in severe clinical signs. Severe poisoning is often seen when dogs/cats dig up freshly planted bulbs or having access to a large bag of them. When the bulbs are chewed or ingested, it can result in tissue irritation to the mouth and esophagus. Typical signs include profuse drooling, vomiting, or even diarrhea, depending on the amount consumed. With large ingestions, more severe symptoms such as an increase in heart rate, changes in respiration, and difficulty breathing may be seen. 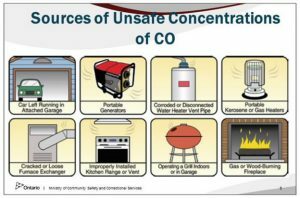 CO is found in fumes produced any time you burn fuel in cars or trucks, small engines, stoves, lanterns, grills, fireplaces, gas ranges, or furnaces. When inhaled, this gas is readily absorbed into the blood, reducing oxygen delivery to the body, and thereby leading to decreased utilization of oxygen in the brain and heart. Fall and spring is mushroom seasons. While 99% of mushrooms have little or no toxicity, the 1% that are highly toxic can cause life-threatening problems in pets. 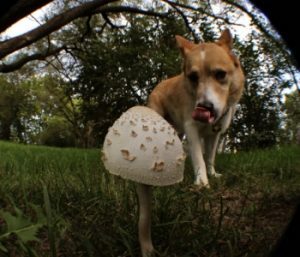 Since most toxic mushrooms are difficult to distinguish from nontoxic ones, the best way to prevent pets from ingesting these poisonous plants is to keep them away from areas where any mushrooms are growing.